Bead on Beads Blog» Blog Archive » Guess who can design too? Guess who can design too? All of you who have been in the store know that the owner Maggie is like a landmark in the midst of all our beads. Walking into the store, you will hardly miss her standing in the front at the cash register, sweetly greeting you in her soft voice. Little do you know she is quite a designer herself! Here’s one necklace she made using quartz and angelic crystals. 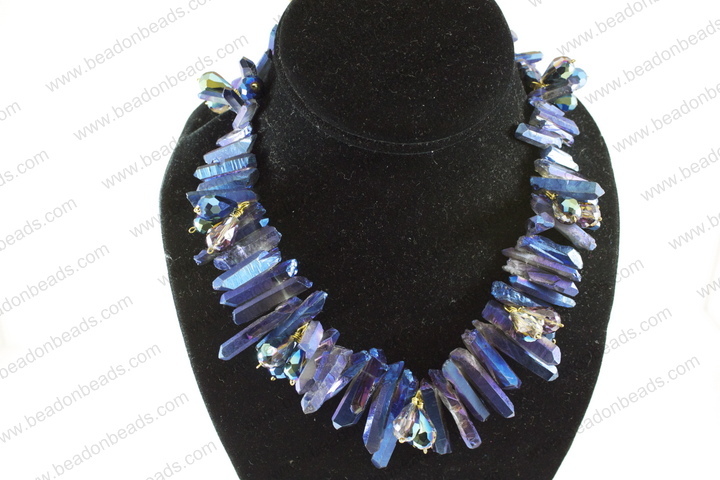 I love the shade of blue in this necklace, reminds me of the deep ocean in midnight. Pretty cool and mysterious… We do have the same quartz and crystals in a gazillion colors here for you to ‘experiment’ with. Stop by soon! Maggie is a Sweetheart! I wish I lived closer and could visit her store more but my husband and I love to come in when we can to buy beads! I love the way it blues. Just purchased the beads and willing to make my own ones. So pretty. I came to the store today and saw the other rustic color. I want to learn how to make one. If you will offer me a class let me know when so I can come.